Auto Punditz – Page 43 – Not just another automotive website! Does Product Life Cycle means anything in the Indian Automotive Space? ‘Tried & Tested’ – the most important attribute affecting the purchase decision of Indian consumer. Don’t believe me? – have you ever seen the santros, the indicas, the altos and the boleros proudly plying on Indian roads and with increased numbers everytime you step on road. Maruti 800 still is sought after by many Indian homes and we do not see any automobile replacing its legacy. Product Life Cycle defines that at a certain age the product grows to its peak, later it reaches saturation level and after some time it slowly phases out of the market. When you analyse this theory in the Indian automotive industry, you surely would be amazed by the uniqueness – consider Mahindras ‘Bolero’ which was launched over 12 years back still manages to easily outperform its young competitors. The story ain’t very different in case of Maruti’s Alto as well – launched way back in 2000 and emerges as the world’s best selling car in 2011! I have seen a person purchase a Hyundai Santro 3 times in his life! Every time he liquidates his old Santro – no other brand makes space in his consideration set else than a Santro again. And this ain’t a special case – many Indian households have the same story. But anythings changed recently? With over 30 new launches in past 2 years and many international OEMs jumping the bandwagon – has given a plethora of choices to the Indian consumer. Gone are the days where we had only padmini’s, 800’s or amby’s available in the kitty. You and me are now spoilt for choices – and boy we love new cars! The younger generation is demanding freshness and novelty – this would spark and make the game more competitive. Can this change the nature of the Indian automotive scenario? – I say YES. When asked to any commodity selling enterprise on what is the most important enabler for the growth – the answer has always been – “Channel Partners”. Name the topmost Cement, Cola, FMCG or Retail Company – you would see one thing in common that they have the best channel & distribution network. The funda remains much similar in case of Automobile OEMs – Hero Moto Corp & Maruti Suzuki have over 4000 and 5000 Sales Touch Points and they are the numero uno Bike & Car OEM in India. Garnering a network this huge is a gargantuan task and thus emerges as the USP of the OEM. Ever wondered on the investment required to open a full fledged dealership (3S)? In a current scenario and considering the OEM quality benchmark the investment can soar upto minimum Rs. 8-10 crores. And the amount of time taken to establish a greenfield dealership could be anywhere between 8 to 12 months. All this investment has now taken a very strategic turn. OEMs need to be much industrious in enabling the profitability of its channel partners and expand productively. With ever increasing competition and razor thin margins, even Auto dealers are becoming much more choosy and wary before zeroing down on the investment – this makes a whole lot difficult for the new OEM entrants to exponentially expand in the market. Note: Number of dealers indicate independent dealers and not sales/service points. In the above data it could be easily implied that the sale of a dealer is directly proportionate to its dealer network. VW & Toyota – It is imperative for you guys to understand that to emerge as a no.1 OEM, you need to hit this nail right on its head. Channel expansion is the key – with rural markets growing then ever and less susceptible to economic vulnerability – Reaching Out will decide the fate of these OEMs. 1)”When Maruti sneezes, the auto industry catches cold” – the statement stands true in any season! Maruti’s figures were the true reflection of the industry’s performance for April 2012. The Indian Auto Industry degrew by over 22%(Month-on-Month) whereas Maruti has de-grown by 20%. The reason still remains Maruti’s dominant market share and sheer size of its numbers (Maruti’s volume was an average 83000/mth in F12!). · 2) Alto’s numbers was at an all time low in past 6 months – with 17842 offtake. Alto had been the unbeaten no.1 of the charts since ages. A dip of 49.37% in Alto volumes M-o-M seems very gullible. The new king of the ring is the most loved Indian hatchback – Swift. With rationalized productions Maruti is not only earning volumes, but also finding place in many awaited Indian households. Seldom did anyone believe when Maruti had announced receiving more than a lakh bookings during its refresh launch. But the numbers speaks for itself. · 3) Maruti did Dzire again! With a shorter boot, attractive price and the fact of being a 3-box car is working wonders for the brand. We Indians just love VALUE; we never get tired/bored with the same food being offered in different plates – IF it is ‘Value for Money’. With a number of 15510 figures, Dzire is whopping 9259 numbers ahead than the next highest selling sedan (i.e. Verna – 6251 nos). · 5) Nissan now loses its ‘Sunny’ side and ‘Micra’ doesn’t seem to do wonders as well. Rather its distant sibling Pulse has been able to steal Micra’s prospects for its more modern look and appeal. Renault’s small distribution network remains a concern and only an explosive expansion strategy could place it at a respectable position in F13. · 6) People just seem to ‘LUV’ the new Ertiga (stands tall at 16th spot with 5464 nos.). With over 15k bookings, and dynamic production line Maruti has created a whole new segment itself! If you thought that these figures would disturb Innova numbers, then you were totally wrong! The existing MPVs (Innova & Xylo) did their normal run without any dent on their numbers. The effect was rather seen on C-segment sedans. · 7) Bolero – 6th highest selling passenger car! (8205 nos.) We would get tired discussing its success; but the brand does not! Such a consistent performance is never seen in Automotive history. Even Nostradamus would fail predicting Bolero’s business cycle. Similar is the case with Maruti’s Omni – feat of 7321 offtake achieved just by selling a petrol variant! These old war horses have turned out to be cash cows for these OEMs. · 8) Eon evolves as Hyundai’s top selling brand – a sweet spot for the OEM. But the purpose would be achieved, only when it matches Alto’s volumes – a distant dream, but quiet possible. · 9) Rapid consistently overtakes Vento volumes. VW would surely not be happy with this. · Hyundai again rules the C+ segment with its Verna. It plans to extend its success with the new Sonata(but the volumes of 66 nos doesn’t speak so). · 10) Fortuner – 1270 nos, XUV 500 – 3403 nos; I wonder how we manage to sell these with such ease. The volatility of Indian market amazes me with what it has to offer. And the love for SUV’s just seem impregnable. · Any predictions for May’12 ??? Financial Year 2012 was a landmark year – both in a positive and negative manner. It paved way for many breakthrough launches – saw the launch of segment defining Fluidic Verna, excellent value for money XUV 500, Hyundai’s entry level offering Eon and many more. It also displayed its sudden love for MPV/MUVs in the Auto Expo – Maruti’s Ertiga, Chevrolet’s Enjoy and Nissan’s Evalia were the most sought after showcase at the expo. We were now exposed to the hard truth as well – that how labour intensive the auto industry is… A labor strike can strike at Maruti shook the entire Auto Industry. The aftermath took its toll on the overall numbers. This was further catalyzed by inflation, consistent fuel hikes and rising auto interest rates. The world’s fastest growing automobile market was now under analysts scanner for its sheer volatility. Demand for cars fell for the first time in three years last July and slumped by the most in over a decade in October. SIAM which had projected a growth of over 20% had to instantly lower its projections. The Industry’s lackluster performance reflected in the overall performance of the country. In a recent report, S&P cut its outlook on India’s BBB- rating to negative from stable. This is surely not a good news for the Indian Industry in overall. The low-end hatchbacks were the ones to take the beating in FY12. For perhaps the first time in many years, small cars reported a decline in growth in 2011-12 (FY12), largely on account of Maruti Alto’s decline. Now, SIAM has forecast 10-12 percent growth in overall passenger cars for this fiscal, but this number may be lower if small car growth is again hindered. SIAM data showed that the mini car segment – which comprises Maruti 800, Alto, A-Star, and WagonR, the Chevy Spark and Hyundai’s Santro and Eon – declined by about 7 percent to 6,42,009 units (6,90,812 units) last fiscal. Sales of the Alto, the single largest selling car in India, had fallen by about 11 percent between April and February 2012. Also, for the first-time ever, bigger diesel cars – the SUVs – are selling more and there is no slowdown in ‘dieselisation’. India’s largest automaker, Maruti Suzuki, expects car sales to increase by 10 per cent in the fiscal year beginning in April led by diesel models. Diesel car sales are expected to rise by 150,000 in 2012-13 while sale of petrol cars fall by 50,000, said the company. * Sales of motorcycles rose 12 percent in the previous fiscal year to 10.1 million vehicles ( 10,096,062 units). * Scooter sales shot up 24.5 per cent, to 2,562,841 units. * Total two-wheeler sales were 13,435,769 units in 2011-12 against 11,768,910 units in 2010-11, up 14.2 per cent. * Commercial vehicles, Siam said total sales in FY12 were 809,532 units, up 18.2 per cent. * Three-wheeler segment, that saw a decline of 2.4 per cent at 513,251 vehicles in FY12. # SIAM has projected passenger car sales growth at 10-12 per cent in 2012-13. # Sales of trucks and buses, a key indicator of economic activity, rose 18.2 percent in 2011/12 and are seen growing 9 to 11 per cent in this fiscal year. # SIAM has pegged the motorcycle segment to grow 10-12 per cent in FY13 and scooters by 15-17 percent. Two wheeler segment is expected to have a growth of around 14-15%. # Commercial Vehicles is projected to grow by nine to 11 per cent in FY13. # SIAM has also projected five to seven per cent growth for Three Wheelers. 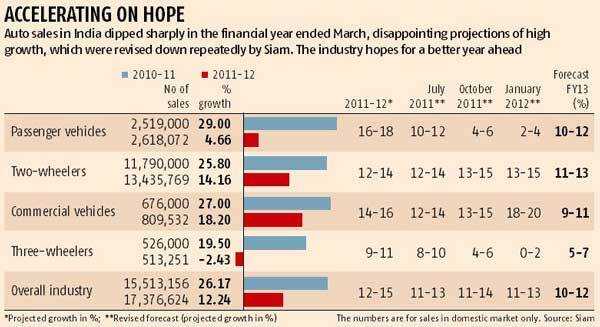 Will 2012-13 ‘change the game’ and put Indian Automobile Industry back on track? Past 5 months sale has been the testimony of the auto industry’s revival. And with specialty launches like Ertiga, Duster, Sail, Ecosport, Compact Xylo under pipeline; we’re optimistic and confident on our projections – Team Punditz. Although the YoY volume growth of the industry remained in double digits, the pace of growth during the last quarter was at its lowest gear in the last three years. In an environment where the increase in inflation, fuel prices and interest rates has been the archenemy of growth in the Indian automobile industry at large, the 2W industry has been the most tough and was reflected in its vigorous volume growth. There seems to be an early mix shift underway – favoring scooters over bikes (beneficial to Honda) and favoring executive segment over premium (benefits Hero over Bajaj) has been seen. While growth in scooters appears structural (driven by appeal of the scooter as a vehicle that cuts across gender and age biases), while the growth in executive segment appears cyclical as consumers baulk at high fuel prices and downshift to more fuel efficient products. A long-term trend of consumers preferring premium bikes should resume – volumes should recover, though timing will remain uncertain – maybe in FY14, but potentially after that too. Even though the number of offerings in the premium segment seems high, maximum volume churners still remain the products in executive & economy segments. With an aggressive pricing for Pulsar 200 NS & Duke 200; Bajaj plans to gain strategically in terms of volumes over the period of time. Bajaj’s dominance in Executive segment is the the primary reason for its high operating margin and thus emerge as one of the most profitable 2-wheeler OEMs. HeroMotoCorp is now world’s largest manufacturer of two-wheelers. The company has benefited from the demand shift to motorcycles, as it focuses solely on this product segment (although has a product called Pleasure in Scooter segment). With fuel efficiency and riding comfort as the main selling points, HMC has been able to address a wide market and post robust sales growth even after its separation from the Japanese major Honda. Bajaj Auto is well positioned in the motorcycle segment as the 2nd largest player with around 30% market share. Over the last decade, the company has successfully changed its image from a scooter manufacturer to a two-wheeler manufacturer. Its product range encompasses scooterettes, scooters and motorcycles. Though the company is miles behind Hero in terms of sales volumes, it is now India’s most profitable two-wheeler manufacturer. TVS Motor Company Limited is the third largest two-wheeler manufacturer in India. It is the flagship company of the parent TVS Group employing over 40,000 people with an estimated 15 million customers. It manufactures motorcycles, scooters, mopeds and auto rickshaws. TVS Motor is credited with many innovations in the Indian automobile industry, notable among them being the introduction of India’s first two-seater moped, the TVS 50cc. The company became the leader in its category of sub 100 cc mopeds, having sold 7 million units. It also introduced the TVS Scooty, which is India’s second largest brand in the scooterette segment. The TVS Jive launched in November 2009 became India’s first clutch-free motorbike aimed at a stress-free rider experience. But the growth in F12 was dismal and seems to lose ground against competition. Honda Motorcycle and Scooter India, Private Limited (HMSI) is the wholly owned Indian subsidiary of Honda Motor Company, Limited, Japan. Founded in 1999, it was the fourth Honda automotive venture in India, after Hero Honda, Kinetic Honda Motor Ltd and Honda Siel Cars India. The entry of Honda into the Indian market as HMSI began with the launch of the Honda Activa, a 100 cc scooter. A slightly modified trendier version of the Activa was soon launched, as the Honda Dio. Honda Eterno was launched thereafter to add to the portfolio of HMSI’s scooters. The Honda Unicorn was the first motorcycle released by HMSI. The Honda Shine has since been released. India Yamaha Motor, IYM (officially India Yamaha Motor Private Limited) is an Indian subsidiary of Yamaha Motor Company, formed in 2008 as a joint venture with Mitsui. It produces a range of motorcycles for domestic consumption and export. Yamaha motors in India have been present in the market of low range economy bikes for a long time. All bikes in their store were designed for mass market, but with the introduction of FZ-16, FZ-S, Fazer, and R15 they have made an impression on the mid range bike market in India. Suzuki Motorcycle India Pvt. Ltd. is a subsidiary of one of the world’s leading two-wheeler manufacturer Suzuki Motor Corporation. The company’s products include motorcycles and scooters. The company was incorporated in 1997 in India. Mahindra Two Wheelers Limited (MTWL) is backed by the Mahindra Engineering Services (MES), the Italy-based design house, engines engineering and Taiwan’s Sanyang Industry Company Limited (SYM). In 2011 Mahindra became the first Indian two-wheeler manufacturer to enter the Moto Grand Prix Championships. This two wheeler maker formally entered the two wheeler industry by acquiring with the successful acquisition of business assets of Kinetic Motor Company Limited. Automobile sales in March 2012 ended on a high note with a few two wheeler OEMs hitting all-time high sales volumes. Hero Moto Corp achieved its highest volume of 528290 numbers in the month. It also crossed the 60 Lakh sales volume for the first time in its history in this financial year (F12). 2> Segment-wise Bajaj sold 300,848 units of motorcycles in Mar’12, up 10 per cent from 274,392 sold in the corresponding period of last year. History created – Pulsar cumulative sales exceeded 5 million units since launch. 3> Honda reported 49.68 per cent jump in its total sales for March at 2,20,487 units compared to 1,47,301 units in the same month of 2011.
b) motorcycle sales went up by 24.97 per cent to 82,353 units as against 65,899 units in March’11. 4> Yamaha reported a 14 per cent increase in its total sales at 41,886 units in March 2012. 5> TVS Motor’s two-wheeler sales witnessed a 3.48 per cent decline at 1,80,274 units from 1,86,781 units in the same month last year. 6> Suzuki Motorcycle India reported a 28.50 per cent growth in March’12 sales at 35,158 units. Honda overtakes Bajaj in domestic 2 wheeler sales and emerges as the second-largest player in the country’s two-wheeler market. 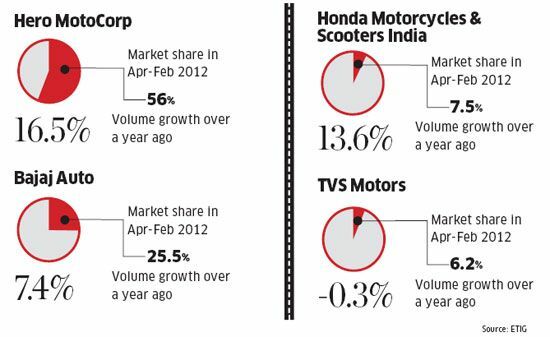 Not so long back, in November 2011 Honda had overtaken TVS as the third largest 2-wheeler OEM in terms of volumes. Honda has been very aggressive in its strategy since its separation from Hero. It has already in plans to launch the splendor-competitor – 110 cc ‘Dream Yuga’ into the market which the company expects will tremendously increase its penetration in motorcycles. Companies like Suzuki also have aggressive plans under its kitty – it has already launched its 125cc scooter named Swish and has fierce plans to fight out Honda’s Activa in the category. Suzuki has also charted out to bring its 125 cc Hayate and believes that the segment has a huge potential to be tapped. Amongst all this competition, Hero Moto Corp has been successful in maintaining its market share and thus emerge as a true – ‘Hero’. It has already tied-up with Erik Buell Racing to improve its technology and has vigorous investment plans to increase its R&D spend. It has even partnered with AVL for developing engines. With all this Hero Moto Corp hopes to hold its dominance in the Indian Market and effectively hinder competition’s moves. Bajaj is counting on increase in motorcycle sales for continuing its market stand. Its exit from scooter category is questionable and its weak presence in 100-125 cc has been Bajaj Auto’s biggest pain point. But it is still confident with its dominance in executive/performance bikes segment. It recently launched KTM Duke 200 and Pulsar 200 NS to expand its product range in the category. With Duke coming in; it surely has a strong product in hand to compete against the R15’s and the CBR’s. India has slowly emerged as a hot favorite location for Auto Makers. Its central proximity along with cheap trained manpower makes it much lucrative. The local volumes itself speaks of the glory and currently it is just a tip of the iceberg. The volumes are bound to grow multiple folds in coming few years. This has made OEM’s take the Indian ground seriously as part of their strategy. India has become important to the whole world and this is becoming like an export hub for specially small cars and components globally. Never before Auto majors have launched cars specifically for Indian consumers but now they appear to be giving immense importance to Indian market. The export volumes for the last four years, too, suggest a strong correlation with domestic demand. In years, when the domestic market has been sluggish, auto makers have been aggressive on exports and vice versa. The export volume of Hyundai & Ford speaks for itself – around 34% and 26% of overall volumes of Hyundai & Ford were exports!!! While it is clear that the Indian-origin OEMs were busy satisfying the domestic demand. 1. Toyota started the export of its Etios & Liva from April’12 with the first batch of 247 units shipped on April 4 from Ennore. Toyota aims to export 20000 cars this year. 2. Nissan India has exported 85,000 cars till date, manufactured at its Oragadam facility and posted a record export of 14,403 units in January 2012. The company is planning to increase the volume of exports in 2012 and targets car exports worth Rs. 500 crore approximately. Export is now being looked as a strategic advantage for OEMs citing the volatility in the domestic demand. In the coming years I’m sure that the percentage of exports is bound to equal domestic volumes. · 1) Pre-Budget hype along with achieving ‘year-end’ targets seems to have worked for OEM’s. Many auto companies even attained their best-ever figures for F12. · 2) Maruti repeats its success – crosses 1 Lakh figure AGAIN! Although the growth was just marginal 2.1%. Alto crosses >35k figure after 12 long months. · 3) The backlog for Swift remains unending. It is just impossible to imagine how a premium hatchback manages over 20k figure consistently (whereas GM with its combined portfolio sells 10563 nos, Ford 9026 nos., Honda 11016 nos., etc). · 4) The shorter Dzire proves capable enough to cater to a longer audience! With just under 4 mtrs, it is one of the most acclaimed entry-level sedans in the country. No wonder it garners 16451 numbers offtake. · 5) The best decision of GM for F12 was to launch Beat-diesel. The capable hatchback with the diesel heart has been the savior for the OEM. Another winner in its portfolio is the ‘Diesel Rocket’. The incredibly stylish and powerful car was successful to influence 722 nos ‘CRUZE’ing away to their showrooms. · 6) Wondered which is the new Mitsubishi Ad wandering around in the TV channels. March saw some movement and buzz with Mitsubishi – their launch of Pajero Sport and Outlander (7str). Pajero Sport clocks 206 nos in its first month! · 7) Brio??? It sure loves its OEM back. After a huge shortfall in production, it bounces back with 6355 nos. A diesel engine on this baby could work wonders for Honda. Hope they hear it soon. · 8) An SUV/MUV crossing 10k mark used to be a distant dream… Now, it isn’t. The ‘Take on Anything’ attitude of Bolero has enabled it to do a ‘Break Free’ 10078 numbers!!! And with this it achieves the dream-figure of over 1Lakh offtake in F12. BOW DOWN for the Leader. · 9) GM silently slips in its BS4 compliant Tavero NEO3. Competitors beware. We all know what this silent value-for-money machine is capable of. Acceptance of its Rover engine is a crucial test for the MPV. · 10) Tata is giving sleepless nights to Hyundai with the fear of dethroning it from the SECOND spot. It has been aggressive in all fronts to promote its range. Be it reviving Mr. Ratan Tata’s dream Nano or revamping Indica range, they are trying everything possible in the book (Ex: Get a NANO with a downpayment of Rs. 15k!!! And exchange bonus of Rs.20k on a 2-wheeler J ). · 11) Nissan Sunny – 4151 nos, Nissan Micra – 1674 nos. I’m not kidding, if this would’ve been told to me 1 year back I’d have totally written it off. Just imagine how ‘VALUE-CONSCIOUS’ the Indian consumer is! · 12) The NEW fluidic Sonata makes its entry with 92 nos. Its radical design and premium outlook seems positive. Although Hyundai has never been successful in its ‘premium’ ventures; tracking Sonata’s run would be interesting. · 13) XUV 500 with 3196 figures stands tall among its competition. Analysts remain awestruck with the volumes this beast manages to gain. · 14) With the increased ‘cost of acquisition’ lurking around; it is exciting to see how the customers react to it. April’12 will be a real test for the industry. 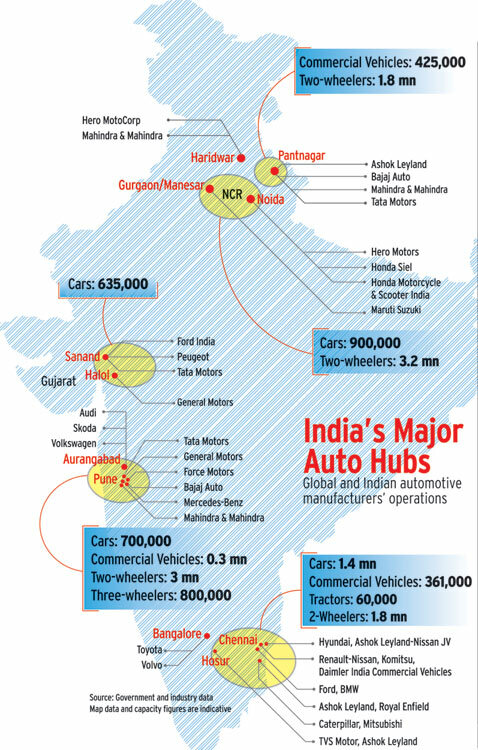 India has proven to be a frugal hub for Automobile OEM’s due to its location and skill advantage. India is a now a part of the global strategy for these OEM’s; every company is planning to set up their manufacturing base in the country and are also exploiting its option as an export hub. Indian Auto Industry stands second in Two Wheeler sales, third in Small Cars sales & fifth in Commercial Vehicle Sales. These figures are bound to move towards the numero uno position in the coming years. No doubt India is now the Investment Hot Spot for these Auto Majors. PSA Peugeot Citroen has even made its second entry after leaving its operations in the 90’s. Almost all cos. are planning to double their production capacities with the intention to stay competitive in lieu of increasing demand. But at the same time volatile market conditions & unstable government policies are making these OEM’s reconsider their plans. And Gujarat has emerged as the blue-eyed state for all major investments and seems to overtake Chennai(TN)/Pune(Maharashtra) as automobile hub. The plans is to enhance the production capacity to the level of 40 Lakh passenger vehicles. Setting up multiple manufacturing bases is also a part of the location strategy, where the OEM is not completely dependent in terms of manpower/taxes/proximity. The recent labor turmoil in Maruti had literally shut down its overall operations and the damages stood irreplaceable. Even when Maharashtra Govt. lifted its tax benefit, companies such as M&M, VW started looking out for other states as investment options. Gujarat, however due to its Investment friendly policies and low corruption emerged as the darling of OEM’s. It would not be an exaggeration to term Tata’s shifting its Nano plant to Sanand in an OVERNIGHT. Now companies such as Maruti, Peugeot, Hyundai, Renault/Ford have all approached the state for their Expansion drive. What is it that makes the segment all that lucrative? Indian Luxury Car Sales has performed in a time when the Auto Industry was reeling with lower demand and declining sales. The downturn had its impact on all segments of the industry except the luxury space. Name a OEM that manufactures luxury cars and you’ll find one in India. Until fifteen years back the only name familiar in the segment was Mercedes. It enjoyed ubiquitous status in the space and was undeterred till the German counterparts arrived. This later led to the rapid influx of almost all luxury OEM’s in the Indian market. BMW was successful in continuously overtaking Mercedes-Benz as the top luxury car maker. The growth has led the OEMs to think very aggressively to improve their stand; For Ex: BMW launching ‘India Specific’ strategies – pricing the 3 series and X1 under 24 Lakhs (for corporate edition). BMW was also focussed in increasing their outlets across the nation. Similarly, Volvo India also launched a similar initiative of lowering its prices for the entry-level S60 sedan. Their outlet strength still remains a concern with only 7 outlets in the country. The OEM is focusing to double the same by F13. It is amazing to analyze how the customer profile has changed. Be it the real-estate boom or the growing number of entrepreneurs, purchase of luxury cars remains the symbol of Power, Recognition, Independence & Status. A local farmer from Kolhapur is purchasing a Merc, a beedi factory owner from Raipur is buying a BMW, young IT professional from Pune is owning an Audi, young inherited industrialist from Delhi is driving a Ferrari – one can see the variance in the customer profile and also their similar inclination towards luxury cars. The emergence of the rural India has again increased the market for these cars – who had expected Mercedes-Benz to sell 113 Mercs at Aurangabad & 180 Mercs at Kolhapur in one shot! The above list is bound to increase and so does its sales. The attractive financing schemes has also attracted the luxury C-segment car buyers to jump to this segment (Currently BMW is offering its X1 at an EMI of Rs. 15,999!). Second hand car market (used car business) will also grow – Merc & BMW have already jumped into the bandwagon assessing its potential. With F1 coming in, the craze has put the nation on its toes. The love for luxury cars had raised to the next level. It will be interesting to see how the coming years shape this segment of the market.